Visit The most Incredible exhibitors not seen at any other showcase! Take home incredible prizes from every vendor. Over 50 of the top Bridal vendors will be present..
A Whole Day Showcase An Exhibition Area, Fashion Show Runway & An Exuberant Media Package That Will Be Treat For Viewers, Guests, Attendees & All The People Involved In The Endeavor. This event is not just a platform for exhibiting local and international talent and services but a stage that facilitates business relationships. 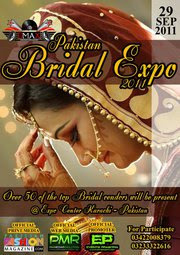 All the different businesses that form the wedding industry of Pakistan are expected to take part in the event. People from all over the country are expected to gather and witness this great fashion event; to have a glimpse at the ethnic contemporary variety of Pakistan. YOU WANT TO BE THERE AND SEE WHAT THE WORLD'S BIGGEST BRIDAL INDUSTRY HAS TO OFFER! !